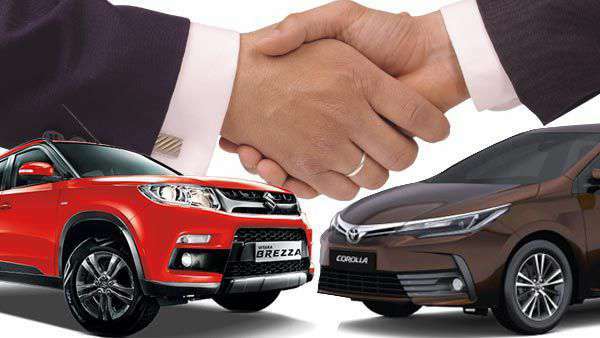 One of the biggest Japanese automotive giants, Suzuki Motor Corporation and Toyota Motor Corporation have officially come together under a new business partnership. The auto manufacturers had first announced their plan towards a business partnership over new ideas back in October 2016. In February 2017, Toyota and Suzuki had concluded a memorandum and joined hands officially and since then, they have been working on innovative projects for collaboration in areas including environmental technology, safety technology, information technology, and component sharing. The news emerged as one of the biggest in the auto industry globally as one of the biggest carmakers will be exploring new ways of cooperation in tech, safety and the mutual supply of products and components. In March last year, both the auto giants finally announced the new partnership and concluded a basic agreement for supplying hybrid and other vehicles to each other in the Indian market. As per the agreement, Japanese auto major Toyota is gearing up to launch its version of Suzuki’s premium hatchback Baleno in the Indian market in the second half of next fiscal while Toyota has been working on incorporating its own unique features to the model. Furthermore, in November 2017 the automakers also announced an MoU to consider a cooperative structure for introducing battery electric vehicles in 2020. In a latest news Japanese auto major Toyota is gearing up to launch its version of Suzuki’s premium hatchback Baleno in the Indian market in the second half of next fiscal, according to sources. Toyota has been working on incorporating its own unique features to the model that has been a runaway success for Suzuki’s Indian arm — Maruti Suzuki. “Under the Toyota-Suzuki tieup, each company will sell mutually supplied vehicles under their own respective brands and nameplates. Beyond that, at this point in time, we are not in a position to discuss further details such as vehicle specifications of our future product plans,” Toyota Kirloskar Motor Vice President Atsushi Oki told . He said Toyota will further boost its outlook on component localisation in support to “Make in India” initiative to achieve cost effectiveness. At present, Maruti Suzuki sells the Baleno in the price range of Rs 5.42 lakh and Rs 8.53 lakh.